According to a survey conducted by espnW/Aspen Institute (2014), parental concerns about risk of injury fell higher then concerns of cost, time, coaching quality and overemphasis on winning. Furthermore, one in four (25.6%) parents say they have considered keeping their child from participating because of fear of concussions or head injuries . At Billings United, we look to put these concerns to rest through parent, coach and player education. Our year round lectures provide information on the latest research and recommendations for injury prevention. Our coaches only have a limited amount of time to impact our players, so we want to optimize the time we have by keeping players safe and injury free. The educational safety material we present to our coaches each season is complimented by our safety protocol listed in our Policies and Procedures Manual. At Billings United, we believe that learning to play soccer is similar to mastering any other subject; it takes an education, time, practice, and passion. We provide the education, but the rest is up to each player. You might be asking, “How is the soccer education different at Billings United?” First, we focus on the controllable process instead of the uncontrollable outcome. Winning, playing time, playing position and referee calls are all out of a player’s control. In contrast, effort and attitude are within a player’s control. We choose to empower our players by stressing factors within their control. We also feel that there are more learning opportunities in a challenging environment. A game that ends in a 2-3 loss is far more valuable then a game that ends in a 9-0 win. When players encounter adversity they are able to develop vital character traits such as resiliency, integrity and respect. These traits are important to success on and off of the field. Another feature that sets our education apart is our curriculum. You don’t have to look too far to see that there are knowledge gaps in Billings area players. For example, some 12 year olds know what a wall pass is, while others have never heard of a wall pass. These knowledge gaps force coaches to backtrack on information, which often results in player frustration and inefficient use of time. Billings United believes that every player has the right to a premier soccer education, despite his or her skill level, coach, team or economic status. The curriculum provides a sequential progression of information broken down by age and topic. Coaches are required to cover topics in order to ensure that there are consistencies in the information being delivered to all players within the club. The final element that Billings United considers to enhance learning comes from research in neuroscience. Essentially, it’s all about neurons! Neurons are the cells that make up our nervous system. The 86 billion neurons in our brain burn through 20% of our calorie intake even through our brain is only 2% of our total body weight! Why are these neurons so metabolically expensive? Our neurons fire to control our muscles in order to perform work on and off the ball. Our neurons also fire to control our brain so we can make decisions on the field. Humans – youth in particular – are born with the amazing ability to generate more neurons and “train” existing neurons. This is called neuroplasticity. Essentially, this means that the more we practice something, the more nerve pathways we create and the quicker those pathways can send a signal to our muscles and/or brain. When a player scores a bicycle kick goal, the crowd goes crazy and fans say things like, “A once in a lifetime goal!” or “That can never be done again!” The truth of the matter is, the player has scored that goal many times in their life. They have performed the skill so many times physically and mentally that they don’t need to think about it in a game. Their neurons are automatically firing when the moment arrives. Billings United believes in training neurons to fire as quickly and effortlessly as possible in order to enhance motor learning. At Billings United we educate coaches and parents about the appropriate amount of time children should be spending on practice and games. Our coaches have shifted their focus from training time to recovery time in order to prevent burnout and overuse injuries. Our club supports multi-sport athletes and cross training in order to enhance performance and prevent muscle imbalance/injury. It has become difficult for players to simply play and have fun due to an over-emphasis on being better than others. It’s this over-emphasis from parents and coaches that puts an immense amount of pressure on players to perform. This pressure ultimately creates poor performance or even worse burnout. At Billings United, we understand that fun is essential to keeping athletes in the game and improving. As a player, can you chip a ball over distance? Redirect a header? Strike a full volley? How many different ways can you change direction while dribbling the ball? Can you trap a ball played to you in the air? All of these skills and more make up your technical ability. 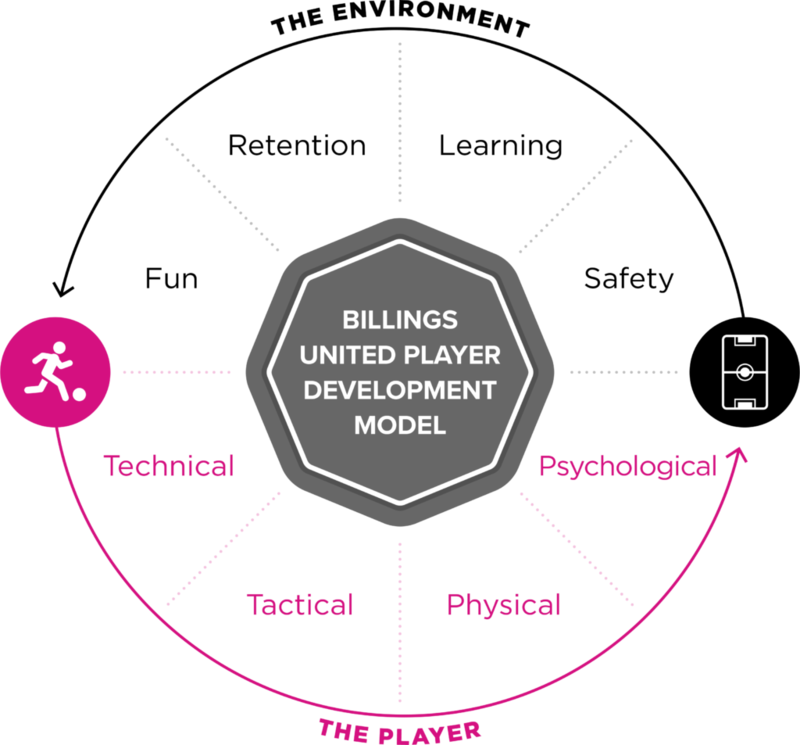 At Billings United, we break down each technical skill into a series of steps so players can adopt safe, effective, consistent form; form that mirrors that of professionals. When teaching the skills, we stress how they can be applied to the game of soccer so players understand why they are learning a skill. Technical skills are so important that the inability to perform one of them properly can be the difference between an average player and an exceptional player. How often do we see a turnover in a game because of a poor first touch? Becoming a complete player means you are proficient in all technical areas. Each technical skill can be viewed as a tool that you can add to your technical toolbox. The more tools you have, the better your decisions will become. This is because you won’t have to think about how you will settle the ball out of the air. Your neurons will already be automatically firing so you can focus on the next step in the game. It has been said that it takes around 10,000 hours to master a skill or sport. However, we believe in more than hours of practice – we believe in deliberate practice. In fact, deliberate practice has been linked more closely to skill mastery then innate athleticism! So what is deliberate practice? Deliberate practice is achieved when an athlete has the motivation to attend to a task. In addition, the athlete must also have knowledge, feedback and repetition. When all of these elements are present, we can reduce the amount of time it takes to master technical skills by focusing on the quality of the practice, not the quantity. If a player is performing a skill incorrectly or continues to make the same poor decisions on the field, they are training their nerve circuits incorrectly and wasting time and effort. At Billings United, we believe that decision making is one of the most important aspects of the beautiful game. This is why we spend time helping players identify cues to recognize where their body, their teammate, or the ball needs to be in a game. Good decision making is the reason professional players have so few turnovers and so much time on the ball. They have the ability to think ahead and put themselves in a good position. Tactical decision making is also the reason a retired 60-year-old professional player can still beat an 18-year-old who is in their prime athleticism. Soccer is easily one of the most physically demanding sports in existence. In a single game, professional players can cover upwards of 7 miles. With such long distances being covered, it’s easy to assume that long, steady runs will get you in shape for season. However, soccer is primarily played in 3-15 second bursts with recovery jogging and walking in between. Soccer is unique in that it is a sport that combines bursts of speed with agility, stamina, power, balance, and strength. With so many dimensions to consider, it’s important that players maximize their training to enhance their performance. A player can train hard for months only to step on the field and realize their effort was being put in the wrong direction. At Billings United, our fitness is game-like, ball-centered, and driven by exercise science. We build sessions around all aspects of the game with the player’s body in mind. We understand how important it is for players to remain injury free and that’s why we incorporate injury prevention into every session. As a player, are you using your emotions to your advantage or disadvantage? In the same way we learn to control our body, we must also learn to control our mind. After all, they are one in the same. Sweaty palms, fatigue, and nausea are just a few physiological responses our body has to stress and anxiety. Nearly every player has experienced anxiety at some point in his or her career. Since the 1900s, research has shown that anxiety levels are directly related to performance in sports [4, 5, 8, 10]. We aim to teach players to control their anxiety level by increasing their self-efficacy. Self-efficacy is one’s belief in their ability to succeed at a task. Simply put, if you think you can, you will. A player cannot have high self-efficacy on the field if they are unsure about where to be or what to do in a game. We believe that knowledge instills confidence, which in turn lowers anxiety and increases performance. Hardy, L., Jones, G., & Gould, D. (1996). Understanding Psychological Preparation for Sport: Theory and Practice of Elite Performers. Wiley, Chichester. Spengler, J. (2014). Getting and Keeping Kids in the Game: A Summary of Key Recommendations by Medical and Health Groups. University of Florida: Sports Policy and Research Collaborative. http://www.aspeninstitute.org/sites/default/files/content/upload/Consolidated_Recs_of_Health_Medical_Groups.pdf. Stewart, C., & Shroyer, J. (2015). Sports Specialization: A Coaches Role in Being Honest with Parents. Strategies, 28, 10-17. Visek, Amanda J. et al. (2014). Fun Integration Theory: Towards Sustaining Children and Adolescents Sport Participation. George Washington University. Journal of Physical Activity & Health. Yerkes, R.M., & Dodson, J.D. (1908). The relation of strength of stimulus to rapidity of habit formation. Journal of Comparative Neurology and Psychology, 18, 65-83.